When Bricco on Queen Anne closed late last year it was disappointing. It really seemed like a perfect dining and gathering spot for the neighborhood and a place I enjoyed visiting. As it was closing there were already announcements that a new restaurant would be taking its place. I was glad to hear that the spot would be filled – I didn’t want to see gaps in the storefronts in that section of Queen Anne. LloydMartin is the restaurant that moved into the spot last fall. While they may have made changes to the interior before opening – I’m not sure – it feels the same to me. It’s a small space and without a complete renovation it would be hard to change the layout substantially. A friend and I popped in a couple of days ago. It was another rainy, dreary June day and I had to run the few feet from my car to the door to escape the deluge. Once inside, the warm ambiance and friendly faces made me forget the ugly weather. For good measure I opted to start with their version of a Manhattan – I figured the whiskey would have its own warming effect. It was a good choice. LloydMartin has a small happy hour menu, which they call Social Hour. I like that alternate name. It’s available from 5:00 pm, when they open, until 6:00 pm. There are both food and drink specials. I believe they change it along with the regular menu, based on what’s in season. We ordered both from both the Social Hour and main menus. 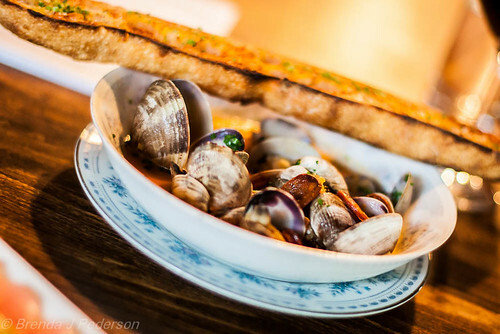 We started with simply prepared, fresh ahi and steamed clams with chorizo. The ahi was impeccably fresh and melted in the mouth. The chorizo gave the clams a nice spicy touch. My favorite part of the dish, though, was the giant slice of bread served with them. Unique; delicious on its own; great for dunking in the broth! Our final choice, my favorite of the night, was a house made fettuccine with morels from the main menu. 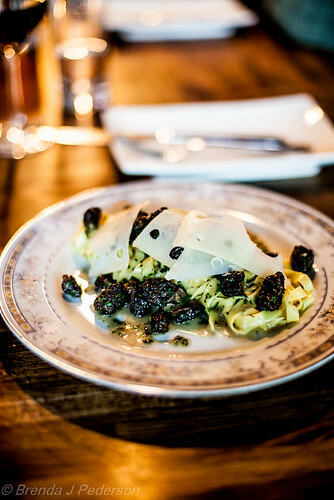 The pasta was tender, the morels earthy and the luxurious sauce bound them together into a cohesive, satisfying whole. Many of the ingredients in LloydMartin dishes, like the pasta, chorizo and cherries in my Manhattan, are prepared in-house so they have total control over tastes and textures in their offerings. While the menu is not extensive there are plenty of interesting and delicious-sounding options that make it hard to decide what to choose. I hope LloydMartin will be successful – they are a great addition to Queen Anne. I’m a little worried though as our visit was on a Friday night and business seemed a little slow. Perhaps is was just the rain. If you live on Queen Anne go check it out. Even if you don’t live on Queen Anne you should go! As an added incentive, I notice that LloydMartin and chef Sam Crannell will be AmazonLocal’s “chef spotlight” on Thursday. That means a special offer for dining at LloydMartin.